I took a break and had dinner before doing this page (turkey pot-pie), so I had it fairly well thought-out before I started it. I only had a few pages to go and wanted to be able to wrap things up. I knew what the page after this one would be, but not what would happen after that. I was concerned that I wouldn't be able to wrap it up, but pressed on with the only idea I had. At this size, it's probably not clear that in panel one she's holding her glasses, about to put them on. The spot she notices on her hand would have come from the ink that ran onto her hand back on page nine (then vanished on page 10). I gave a lot of thought to going back to page ten and drawing the spot on her hand there, but never did. It's too bad I didn't, since it would make the narrative make slightly more sense. 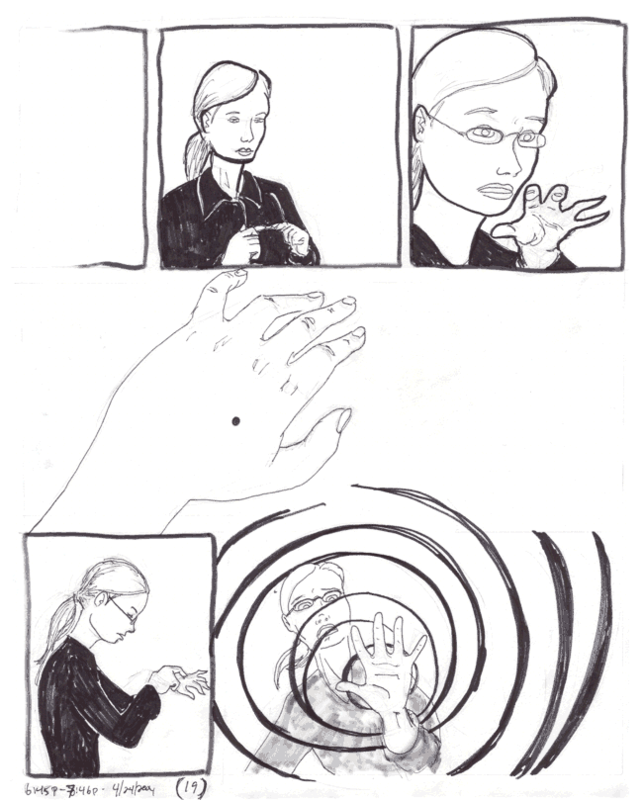 I knew that what I really needed was a picture of her hands prior to page nine clearly showing that she didn't have a black spot on it so that pages nine and ten could show the spot appearing, but I didn't have such an establishing shot, so I talked myself out of the idea of retouching page 10. I also didn't want to risk screwing up a page that I quite liked by putting a black splotch on it. At any rate, the readers can assume that the discovery of the black spot and the resultant events come from the same source that gave us the running then vanishing ink.